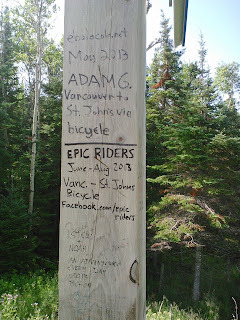 This is the shared blog of the EPIC Riders Team. 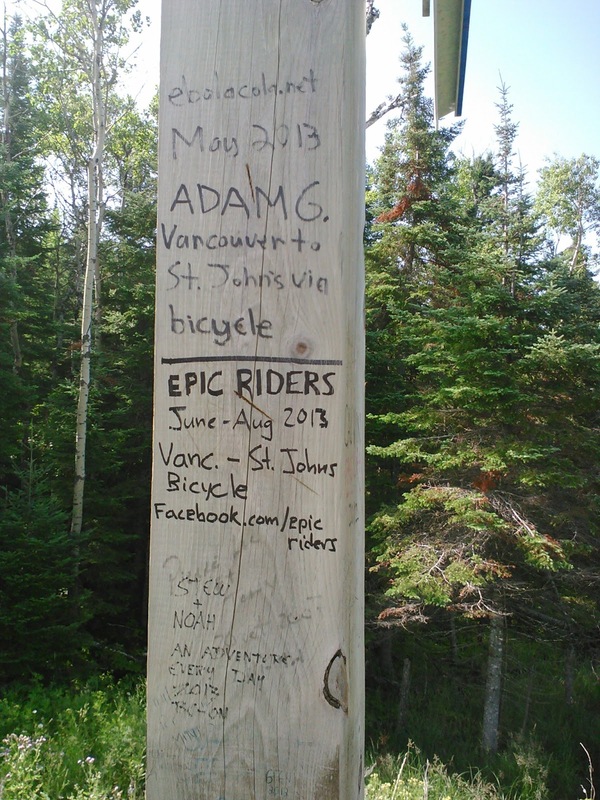 EPIC is helping [E]xploited [P]eople [I]n [C]ambodia by cycling across Canada during the summer of 2013 in support of Ratanak. Visit www.epicriders.org for lots of info! After a great rest day in Winnipeg at the Bredins', we slept in for a bit, had some breakfast, and then the Riders started out at 10 am for Falcon Lake. As I was putting our stuff out to start loading the van, I got a call from Evan, "Hey, Dave fell off his bike, can you come to us?" So I left our pile of stuff at the Bredins, and went about 16km in the van to find the guys. I arrived to find Dave lying on the edge of the shoulder of Winnipeg's Perimeter Highway. We got him into the van, Luke did a little bit of first aid, and then I started driving to the hospital. A couple km down the road, Dave was getting sick, and asked me to pull over. We ended up calling for an ambulance, because at the time, Dave was in shock from his accident, and we thought he had a concussion. The ambulance came and the paramedics said Dave probably had a concussion, so we all went to the hospital (Evan and Luke loaded their bikes on the van). After some time in Winnipeg's Concordia Hospital, we determined that Dave did not have a concussion, but had lost some skin on his chin-which required three stitches-and had scraped up his left hand and bruised his right wrist, plus got a few other scrapes. By the time we left the hospital, and got Evan and Luke to the Trans-Canada, it was 1:30 pm. 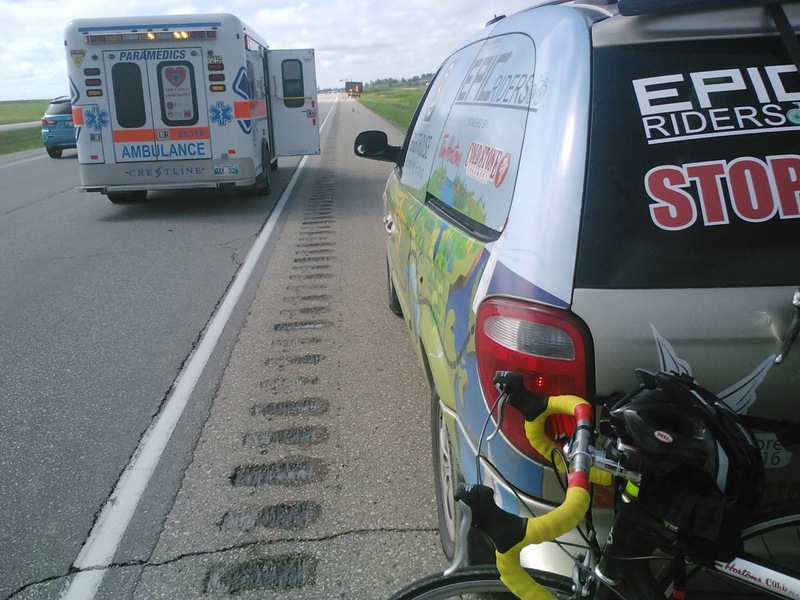 They decided to ride to Falcon Lake, about 140 km away, and Dave rested in the van. Dave and I arrived in Falcon Lake at 7:30; Evan and Luke arrived at 8:30. We stayed at the Falcon Lake Resort Hotel - thanks to the Bredins for setting us up with that. We ate dinner (and breakfast the next day) at the Falcon Lake Bakery Bistro. When we were getting ready to start out from Falcon Lake, Evan got another flat on his rear wheel, and this was due to the tire tube getting cut on spots on the inside of the rim, where the spokes connect in. 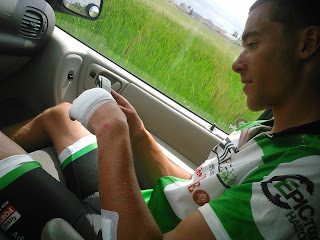 So Luke did the first leg of the riding to Kenora and Evan came with Dave and I in the van so that he could get rim tape for his bike. 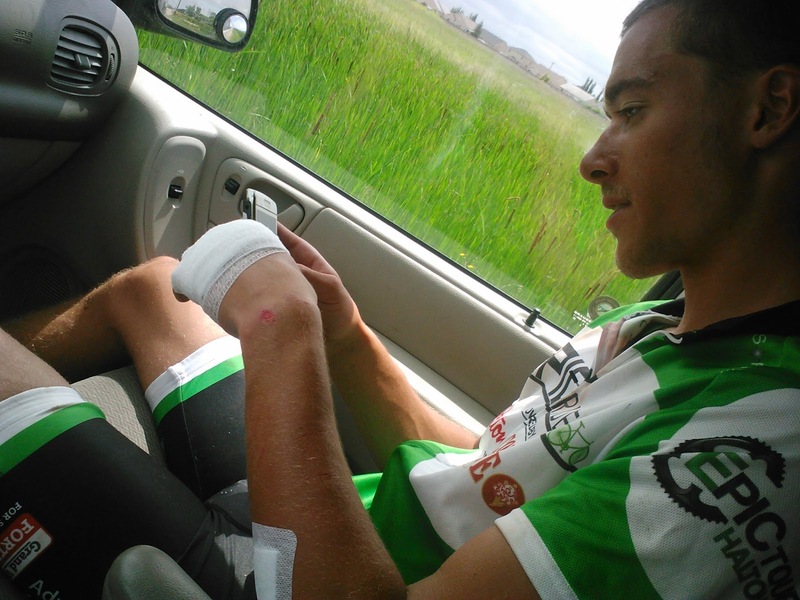 After Evan fixed his tire problem, he and Luke rode from Kenora to Dryden, with 2 rest breaks in between. Over the past couple days the geography changes have been quite noticeable. The day to Falcon Lake, we saw a line of trees in the distance, and since passing that line, the trees haven't really stopped. 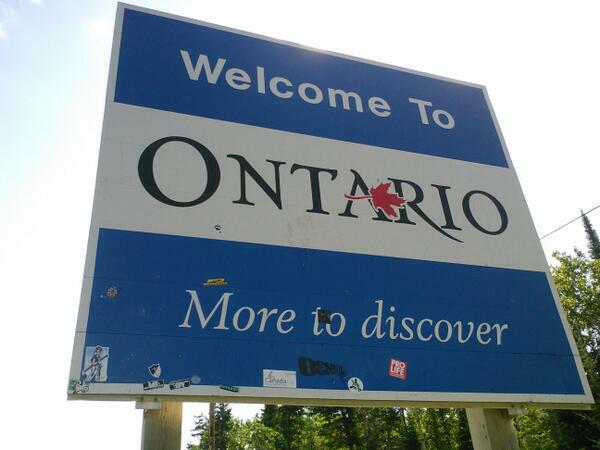 Also, just before crossing the Ontario border, it went from really flat, to lots of hills and twists in the road. Our day ended in Dryden, ON with us arriving at our hosts', Tara & Doug Robertson. We had burgers and hot dogs for dinner and then watched The Hobbit. Sorry if these posts seem rushed, I've written both of these posts' in the Robertsons' living room, and now we're packing up to leave for today's 100 km trip. More posts to come, probably once we get to Thunder Bay. Donation update: $15,294 (about 60% of the way to our goal). Click here to Donate.